Home DNN Open Source... Module Forums Form and List How to use a 5-digit alphanumeric Code to populate form data from database? How to use a 5-digit alphanumeric Code to populate form data from database? I would appreciate some help with how I can pull data from a database to populate a form when a user enters a pre-assigned code into one field of the form so the name, company and email address are entered automatically. This is for a marketing promotion for a client that is trying to get email addresses for prospects in their CRM system without email addresses. We will be sending a direct mail piece (postcard) using Variable Data Printing to print a sequential alpha-numeric, 5 digit code as in "A0000" through "A1000". Each code is pre-bound to a prospect so as to make it easy for them to fill out the form on a landing page by simply entering "their code" which will automatically fill in the First Name, Last Name, Company Name for them. The Email address field is the only other field they have to enter data in. All fields are required. 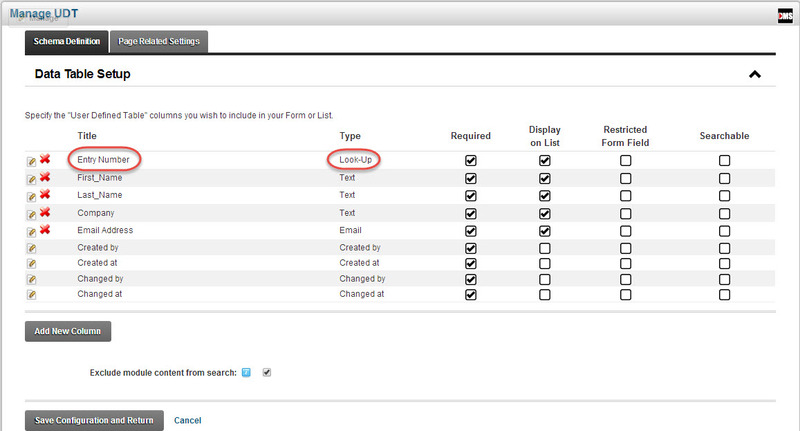 I started with the DNN Form & List module and created 5 fields: Entry_Code; First_Name; Last_Name; Company and Email. Currently I have the Entry_Code field as a "Lookup" field which I would like bind to a database or an existing Excel spreadsheet that contains about a thousand rows. Q: Am I using the right module to do this (Form & List)? If not, is there a DNN module that will work or will we have to purchase a third-party module? Q: If Form & LIst will do the job, can you tell me how to bind the "Entry_Code" field on the form to the "Entry_Code" column on the spreadsheet or database? I greatly appreciate any help you can give me on the fastest and easiest way to accomplish this task!